Updated 7:40 p.m. | Posted 9:29 a.m.
Minnesota budget projections show a deficit of $188 million for the current two-year budget cycle, and a projected negative balance of $586 million for the 2020-21 biennium. The deficits are due to a reduced U.S. economic growth forecast and impacts of enacted legislation during the 2017 session, according to the November forecast released Tuesday by Minnesota Management and Budget. Unknowns in federal policy and the current economic expansion, one of the longest in U.S. history, create significant risk for this forecast. The numbers, though, are grim news headed into Gov. Mark Dayton's last year in office after years of budget surpluses, and the outlook is clouded by pending tax changes coming out of Washington. "Today's forecast is a reality check," MMB Commissioner Myron Frans said. "The risk that our current economic expansion will come to an end is real. We always have to remember how quickly surpluses can turn to deficits." Frans, though, seems to be advising against using rainy-day reserves to fix this relatively modest deficit, calling the forecast gap "more of a mist than a downpour." 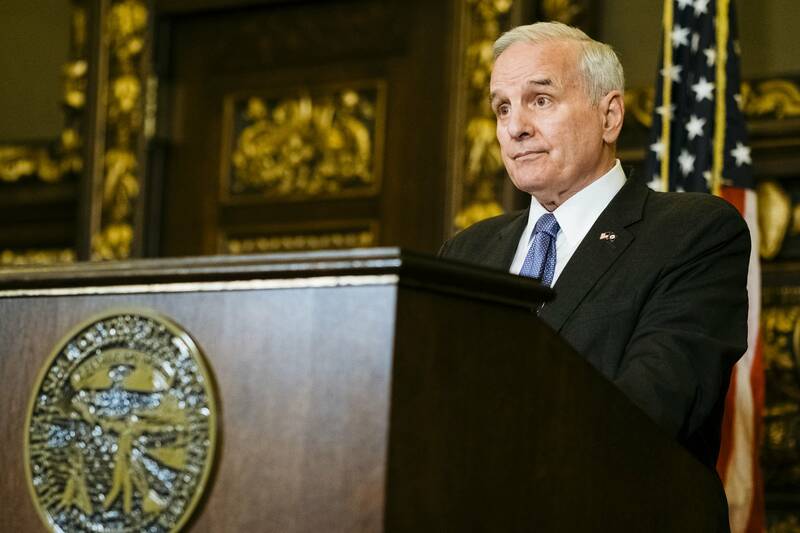 Dayton agreed, telling reporters later that he doesn't anticipate reaching into Minnesota's reserves and said he expects the problem to be dealt with through "modest corrections." But he reiterated he will wait until the next report before producing a fix-it plan. "It's not a sign of any kind of systemic problem, or certainly not a crisis." Republican Senate Majority Leader Paul Gazelka said he believes the state's economic picture is better than what the forecast shows. He called the report "obsolete on arrival." "When you use GDP numbers of 2.2 percent when it appears to be higher, then every number looks bad," Gazelka said. "When you don't factor in the CHIP money that we're going to get, where it would almost be equal, that makes it look bad. And when you first have the federal tax relief in last February's forecast but then you take it out of this one, again, it created a number that's a little lower than it needs to be." Republican House Speaker Kurt Daudt went further, suggesting the Dayton administration may have manipulated the numbers. "This governor and this administration has been more partisan and more political in the things that have been traditionally in Minnesota been nonpolitical and nonpartisan, like our forecasts," he said. Daudt also defended last session's tax cuts. He said the real problem is increased spending pushed by Dayton. "In this forecast now you're starting to see those chickens coming home to roost," Daudt said. Democrats came to a different conclusion. DFL House Minority Leader Melissa Hortman blamed Republicans for the projected red ink. "We went from a $1.6 billion surplus to a $188 million deficit in a little bit less than a year," Hortman said. "So, elections have consequences, and hopefully people will keep that in mind as we move towards 2018." Election-year politics will loom large next session, with all House seats up for grabs and several legislators seeking higher office. In addition, relations between the governor and GOP leaders remain strained following their months-long court fight over House and Senate funding. The Legislature is due back in St. Paul on Feb. 20. Even before the forecast was released, officials were warning that it would be of limited value. Dayton said Monday that uncertainty over the final shape of the federal tax cut bill made the forecast "speculative at best." The Republican-controlled U.S. Senate narrowly passed a $1.5 trillion tax bill over the weekend that would reshape the tax code by cutting individual rates, slashing corporate taxes and potentially leaving states with a drastically different economic picture. The bill also eliminates the individual mandate to buy health insurance, which could have an impact on health care costs. With the projection not accounting for the proposed massive tax overhaul in the works in Washington, Rep. Jim Knoblach, the St. Cloud Republican who chairs the Minnesota House Ways and Means Committee, agreed it could be way off. "Hard to say how much," he said. "But certainly, in the hundreds of millions, it could be off." State officials in Tuesday's report noted that the economic growth estimates were compiled in early November, well before the U.S. House and Senate passed measures to slash taxes over the coming decade. The lack of a federal stimulus — through a tax plan or infrastructure bill — led to reduced economic growth estimates. But Minnesota's economic advisers also cautioned that the country is in its ninth year of growth following the last recession, which is beyond the post World War II average for such expansions. "While simple old age is not thought to end an expansion, the longer the cycle gets, the lower the probability of continuing to avoid a downturn," they wrote. All of it means significant changes could be coming when the next forecast is produced in late February or early March. There were some state spending and tax shifts that had an impact, too. Minnesota collected fewer dollars from income, corporate and sales taxes than anticipated. But it also spent more on education than it planned. And forecasters had to project the state would spend $178 million to pay for children's health programs that would normally covered by the federal government; a reauthorization of that program could come soon in Washington's end-of-year sprint. What's more, the report didn't factor in money that would cover the costs of running the House and Senate, which Dayton had vetoed. If those allowances are restored — there is every expectation they will be — the near-term deficit would have risen to $302 million.